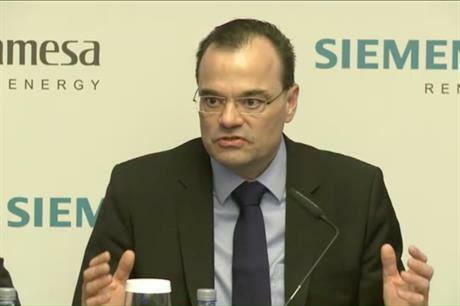 SPAIN: Merged turbine manufacturer Siemens Gamesa Renewable Energy (SGRE) unveiled a plan to cut costs by €2 billion over the next three years, as it sets course for the 2020s, following a troubled first 12 months. At the firm's Capital Markets Day, which was initially due to be held last November, chief executive Markus Tacke was confident about the manufacturer's outlook for the next three years, claiming the firm would almost double the cost of synergies in the firm to €400 million by 2020 — up from the intial €230 million target set in June 2016 when the merger was announced. Chief integration officer, David Mesonero, said the €230 million synergies would be met a year earlier in 2019. The remaining €1.6 billion in cost savings would be made in productivity as the firm relocates manufacturing to lower-cost countries — such as the new blade factory opened in Morocco last October. As part of the firm's so-called "L3AD-2020" programme, SGRE will also look to increase product affordability and scale of its market, as well as "consolidate" global headquarters and "optimise" the workforce. At the firm's annual financial report in November, it was revealed 6,000 jobs across 24 countries would be affected. Tacke confirmed this number at the Capital Markets Day but would not be drawn into breaking the numbers down by region. Tacke also faced questions from a representative of workers from the Miranda de Ebro blade factory in Spain, which produced blades for Gamesa's G80 2MW turbine. At the end of January, SGRE said the site would be closed. The representative of the workers argued the site, which had operated for 19 years, could have been extended to accommodate the longer, more modern blades. However, SGRE's CEO said while it was a difficult decision to make, the factory was making blades for an "unsellable" model of wind turbine, due to its high levelised cost of energy (LCOE). "[We took the decision] because expansion of factory was not possible, Tacke told reporters at the Capital Markets Day. "[Further] expansion of blade factory is not possible. We have three other factories in the region, where we have offered employment to the workers," he added. Under the three-year strategy, SGRE is targeting to grow faster than the global market, both in installations and value. It also aims to reach an Ebit margin of 8-10% -- excluding the affect of the integration, restructuring, and price purchase allocation (PPA). SGRE chief financial officer Miguel Angel Lopez, and Tacke, defended reporting the firm's earnings with the exclusion of PPA and integration costs. "Net income will be positive and is expected to be positive from 2018 onwards. We make the distinction to show objectively which results we are delivering on a continuing basis, regardless of time effects," Angel Lopez said. Tacke added: "We have been transparent with our numbers in Q1. Integration and restructuring costs will go down, PPA is something that remains, and we have disclosed that on our balance sheet." SGRE expects integration processes to be completed in this financial year. Other strategies include keep Capex to below 5% of sales, and a return on capital employed (ROCE) of 8-10%. SGRE is winding operations of Adwen down, following its decision to drop the firm's 8MW turbine from its portfolio, and transferring its pipeline in France to SGRE's own 8MW turbine. The practically now-defunct manufacturer, however, is going to have a continued effect on SGRE's financials for "four-to-five years", according to CFO Lopez. SGRE said it has roughly €860 million in provisions set aside to cope with the wind down of the former Gamesa-Areva joint venture. "We have this thing under control," said Lopez. "We have a clear and solid technical plan and a clear picture, financially, of what will happen. "It is a long tail. We will see a legacy cash impact for four-to-five years." According to its Capital Market Day presentation, SGRE saw a €101 million cash impact in the second half of 2017, with a further €49 million in Q1 of this year. Tacke said, however, the manufacturer has found unexpected synergies between SGRE and Adwen, which contributed to the increased €400 million of savings that will be made by 2020.